A beach town and small port on the West Coast. The town centre has plenty of restaurants, shops and pubs. But it’s the famous poet Robert Burns who is Ayr’s main claim to fame. You can see his cottage and visit the Tam O’Shanter experience in the district of Alloway, a short bus ride from the town centre. Not all the collection is on display at one time, and exhibits change over a period of time. You can enjoy a stroll in the park, or visit the nearby Pollok House Museum. Pollok House has been the home of the Maxwell family since the 13th century, and currently houses a superb collection of Spanish art, furniture, silverware and ceramics. Admission to both venues is free, and a shuttle bus runs between them. 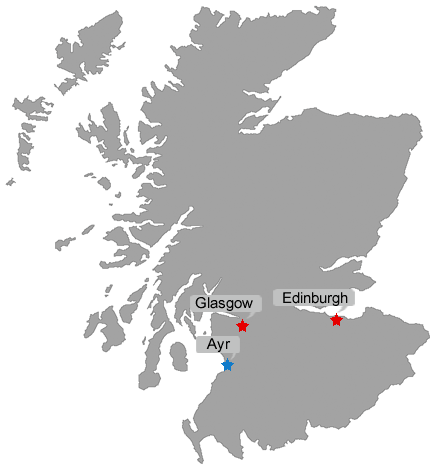 Regular trains from Glasgow Central to Ayr. Journey time is around 55 minutes.